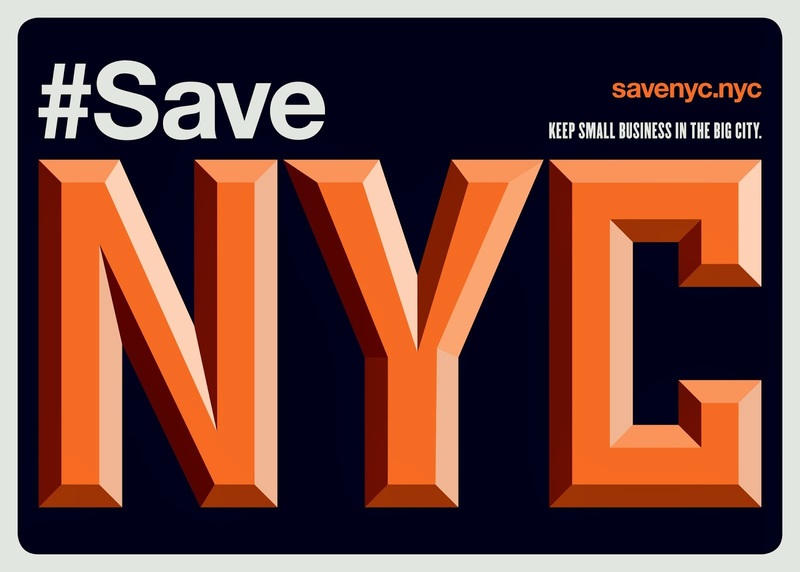 As New York City diners meet their collective demise (and then some), overwhelmingly due to skyrocketing rent and denied lease renewals, another one appears to have joined the list. 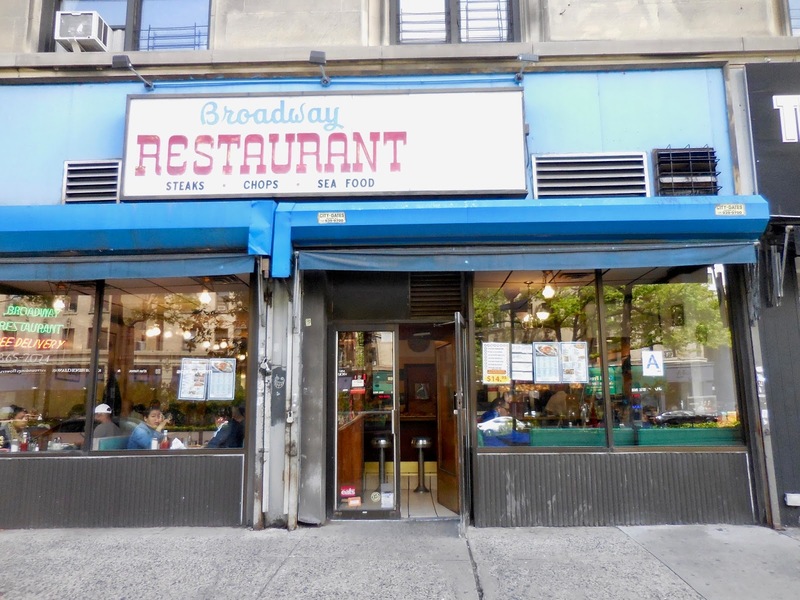 Christopher writes in to say that the Broadway Restaurant at 101st Street has shuttered. There's no sign to say goodbye, or give a reason why, but the shutters have been down for a week and the phone has been disconnected ("temporarily" says the recording--is there hope?). Asks one Yelp reviewer (where the reviews are glowing), "could broadway restaurant be closed ?? -will be missed if true." Maybe they're just on vacation? Though it seems unlikely. I went to the Broadway only once, happily stumbling upon it while I was wandering the neighborhood for reasons I can't remember. I loved it instantly. I loved the sign outside with its "STEAKS CHOPS SEA FOOD," an indication of a certain vintage, and an increasingly rare sight. I loved its interior with the U-shaped counter and the movie star posters. Brad Pitt appeared on the walls several times--maybe because he filmed there once. I loved the hand-painted menu with its CORNED BEEF HASH and TASTY SANDWICHES. The place was busy and beloved. If you know what happened here, please let us know. *UPDATE: Harry points us to a recent article in West Side Rag, reporting that a fire closed the place on New Year's Day. Hopefully, the 47-year-old diner will recover, but the damage looks bad. I passed the Broadway restaurant within the last 2 days & saw one metal gate up & Kraft paper covering the window & door. I could not see inside. No way to tell if it's remodeling or eviction. It reopened last summer sometime and it's like nothing ever happened. 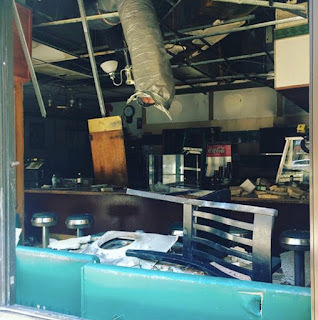 Everything appears oddly intact, with vinyl booths that don't appear new and the U-shaped bar arnd stools and even the fantastic menus/signs above that bar. The only difference I can detect is that it looks slightly cleaner/brighter, as if a brighter light bulb or two were installed. 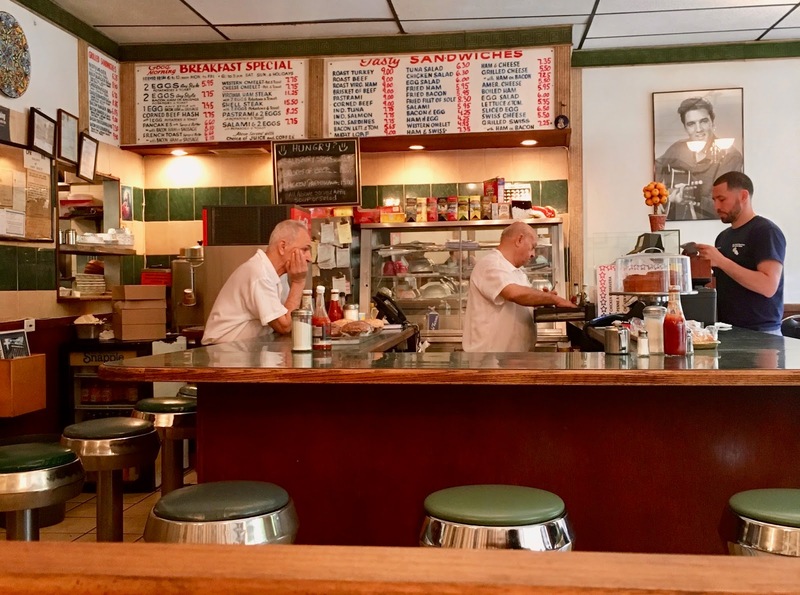 One of the times I was in there after the reopening, seated in a booth in the window, a young woman passed by with a friend, and when she saw it was open, I could see her mouth form the words, 'Oh my God! It's open!" and she started dancing and jumping with glee. It was magnificent.